WINDSOR, ENGLAND — It’s now official. The Meghan Markle is now the wife of Prince Harry and the two are known to the world as the Duke and Duchess of Sussex. The wedding continues to be the talk of the not only the town but the entire planet! One of the hundreds of international media that covered last weekend’s top wedding of this generation, was best-selling DAMPIER and Royal Correspondent Phil Dampier. He’s been covering the royals since Harry was about two years old, and Dampier was present when Harry and Meghan made their first public appearance. Dampier has written extensively in books, magazines, and for websites, and has provided television and radio commentary for events – good and bad, happy and tragic, about Queen Elizabeth and her extended family. In pursuit of news, he has traveled to more than 60 countries following the House of Windsor. Dampier’s new book ROYALLY SUITED, reveals the true story behind Prince Harry’s and Meghan Markle’s romance through a selection of quotations from the couple. 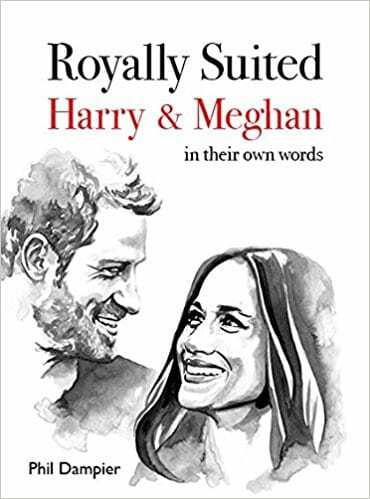 “The book’s title, ROYALLY SUITED, is kind of play on words with the royal couple. It has three sections: quotes from Harry before he met Meghan; quotes from Meghan before she met Harry and quotes after the two met,” shares Dampier. Beginning with Prince Harry’s childhood, Dampier has dug deep into the Royal couple’s’ pasts, to reveal their shared mischievous sense of humor and how both grew up with divorced parents. Prince Harry tells of the effect of his parents’ divorce and the devastating loss of his mother, Princess Diana, and Meghan Markle talks of the racial difficulties she faced growing up as the daughter of a white father and an African American mother. Author Dampier shared more insight about this history-making royal wedding, with the Tribune, in an exclusive interview directly from Windsor, England just hours before the now newlyweds exchanged their vows before the world. TRIBUNE: You’ve been an official Royal Media Correspondent, who’s covered the Royal Family since Harry was about 2-years-old. Prince Harry seems to be a Royal who’s always kind of lived his life ‘his way’ so to speak. From your observations of watching him grow up, has he always been like this? DAMPIER: Prince Harry has always known that he was different. There’s a quote in my book where he tells his brother, Prince William, that he knows one day that he (William) would one day become King. I think that an early age Harry sort of realized that he was the ‘spare and not the heir’ so to speak. So yes, he kind of grew up knowing that he was a bit different. And then obviously, his parents’ divorce was a major blow for him plus, his mother’s death was also devastating. He was only age 12 at the time Princess Diana died. I think he bottled his feelings up for a long time. He became a bit of a wild child. He got a reputation for getting drunk, partying and such. But I think Meghan has probably helped him to unburden him. I think she’s encouraged him to talk about some of the things that had been troubling him. And on the twentieth anniversary of Princess Diana’s death, he gave several interviews where he talked about his struggles. I really think that Meghan has helped him overcome many things. TRIBUNE: Was it a surprise to you and those in the inner circle of the Royal family who really know him, that Harry did not choose to marry a young lady with a background that was more traditional? Meghan is bi-racial, American, a divorcee, comes from a divorced family, raised by a single African American mom. She is absolutely beautiful but has a background that’s totally opposite of someone who would marry the member of the British Royal Family. DAMPIER: Yes, it was a very big departure for sure. She’s (Meghan) not a white middle-class young lady like Kate Middleton is. Only twenty or thirty years ago, this would have been unthinkable for Harry to marry a divorced, mixed-race, American person, It’s just a sign of the times these days and it shows just how much things have changed. The Queen is very pragmatic. I think she realizes the world has changed and moved on. She’s welcomed Meghan into the family. It’s quite unique because previous fiances have not gotten involved in Royal duties but Meghan has already been performing Royal duties even before they married. So that indicates the Queen has accepted her and thinks that she’s doing a good job. TRIBUNE: I know that you have a lot of deep insider sources, so when Prince Harry initially, from the beginning, revealed to Prince Charles, that he was indeed going to engage Meghan, what was his father’s early reactions? DAMPIER: When the news first broke it was definitely a departure from the norm. I think it’s been very difficult for someone like Prince Charles to give any kind of moral guidance to his sons when he himself had a failed marriage. Three of the Queen’s children have gotten divorced. Her sister got divorced, so we now live in a totally different world…Harry’s not the heir in line to the throne immediately. He’s now dropped to sixth place. It’s not quite so much pressure on him now, and he could marry whomever he wanted to. But all of that aside, I think the Queen sees in Meghan somebody who’s going to be a real asset to the Royal family. They need fresh blood because Her Majesty is now 92-years-old, and the Duke of Edinburgh is almost age 97. Meghan will attract a lot of people from ethnic minorities and a lot of people across the Commonwealth. They have welcomed Meghan with open arms and I think she’s going to do a great job. TRIBUNE: How would you describe the relationship between Meghan and her father? Is it close or just what is the true nature of it? DAMPIER: I think we have to assume that the relationship with her father is not exactly a great one. I’ve not seen any evidence that she’s seen much of him in recent years. We know for a fact that Prince Harry has never met him. I find that extremely strange after two years, he’s never met his future father-in-law. So, I tend to think there’s definitely something slightly wrong with the relationship, although she’s made statements saying how much she deeply cares for her father, wanted him to come to the wedding and her main concern was for his health. One has to wonder was she glad that he didn’t turn up at the wedding? TRIBUNE: Since you’ve got such long time extensive experience on covering the Royal Family, in your opinion, what do you think will be one of the major adjustments for Meghan and this amazing new life of royalty that she’s now a part of? DAMPIER: The one pitfall that she might fall into is that if she’s really into a particular cause that’s she’s passionate about, she will need to be careful as to not sound too preachy or trying to dictate to the British public the obvious, that wouldn’t go down well with the British. They don’t like that very much. She needs to be quite subtle about things like that. Just promote whatever the cause is but don’t try to force or ram things down people’s throats. But the good thing about Meghan is that she’s a successful actress and she’s accustomed to being in the limelight. We can see already that she’s very good at working with the crowds and being in public. She’s a natural at talking with people and I think she’s going to do very well in her new role as the Duchess of Sussex.